Sea Breeze 2017 naval exercise has started in Odessa, Ukraine. This is the 17th edition of exercise which takes place in the Black Sea between 10. and 23. July 2017. This year over 3,000 military personnel, 31 ship and 29 aircraft from the following nations is taking part: Belgium, Bulgaria, Canada, France, Georgia, Greece, Italy, Lithuania, Norway, Poland, Romania, Sweden, Turkey, Ukraine, the United Kingdom, and the United States. Unlike previous events this year’s exercise will have no previously written scenario. The specifics of the Ukrainian-U.S. exercise Sea Breeze 2017 are an altered structure of the headquarters, which this year will make up the exercise control headquarters and a separate naval command headquarters, which is developed in compliance with NATO standards. The method used in holding the exercise will be different from that of the previous exercises as well: the international maneuvers will be held in a “free play” mode,” the press center quoted the head of the working group on planning the exercise nominated by the Ukrainian Navy, Deputy Navy Commander on Training Captain Oleksiy Neizhpapa, as having said. Neizhpapa added that during the Sea Breeze-2017, the multinational naval command headquarters will exercise planning and control of forces under given conditions, as well as decision-making and supervising with regard to ship tactical groups and coastal and air force components. This will allow for testing the advanced naval command headquarters’ capability of managing forces and operations to meet NATO standards, he said. Every year, we complicate the exercise program. It’s like in sport. After so many years of cooperation and practice, we are ready for a “free game”. We will work out various scenarios , – said the head of the Sea Breeze-2017 from the American side, Navy Captain Tate Westbrook, the commander of U.S. 6th Fleet’s Task Force 65 and of the U.S. forces on scene. Under the scenario, as explained by Captain Westbrook, the fleet of surfaces ships will conduct anti submarine warfare, try to find and neutralise the enemy submarine, the role played by the Turkish submarine TCG Batıray. Well good luck to the ships in their effort against TCG Batıray. This exercise shows Turkey as the only NATO nation that can deploy submarines to the Black Sea. Romania has one Kilo class submarine on its naval register but no one has seen that boat deployed and Bulgaria disband its submarine force in 2013. 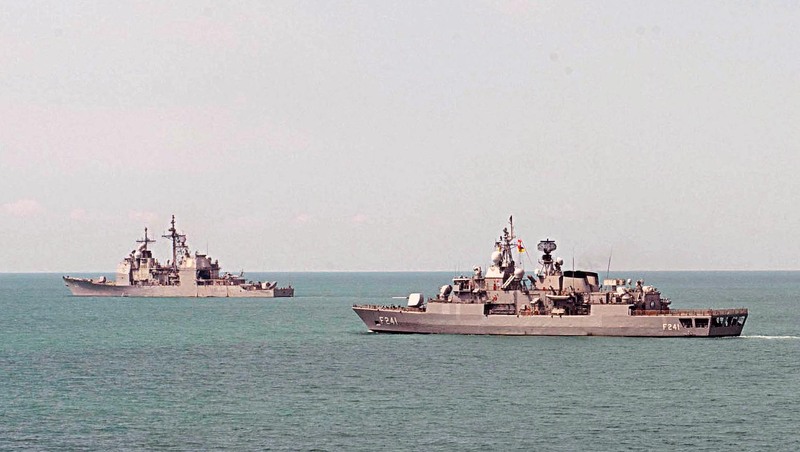 THE UKRANIAN AND TURKISH NAVIES IN JOIN EXERCISES.